They bloom every day ’til they die, year round, a good 10 years. They grow fast too. Every lantana flower head looks like a little bouquet. They smile in single colors (yellow, orange, pink, cream) or in combinations (magenta and yellow, purple and yellow, orange and yellow). One multi-colored variation called Carnival includes blossoms that are pink, red, lavender and yellow – all in one little bouquet. 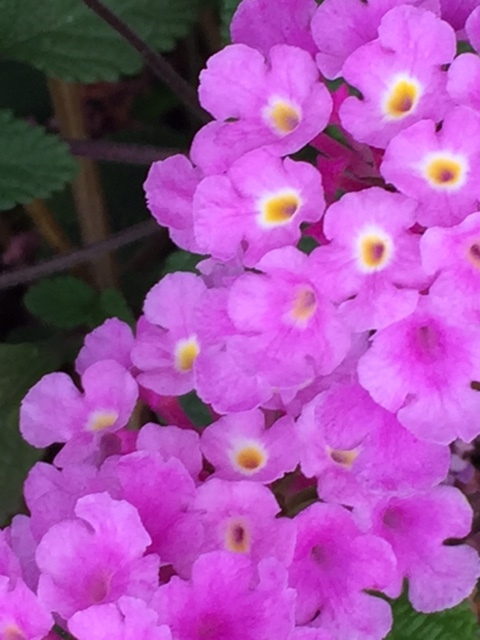 Lantanas thrive here in our beach climate and I pass them every morning spilling from front yards onto the sidewalk. Time to buy one of my own and nestle it into my balcony garden. It’s crowded now, since I potted a jasmine, but there’s always room for one more flower, especially a happy one that will keep the color coming, even if times are not happy. 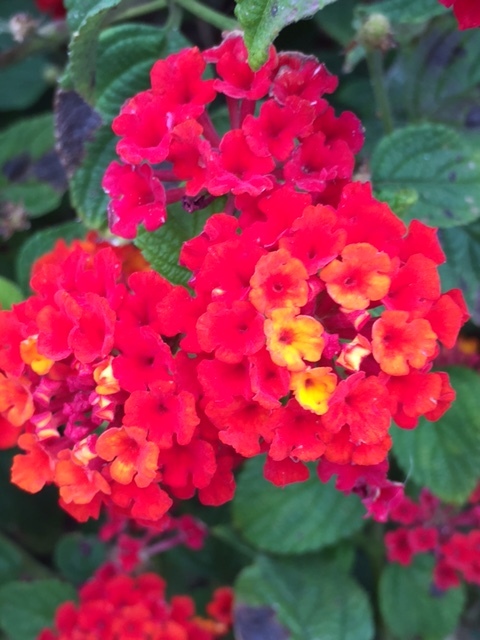 Lantanas are a tropical and subtropical plant that arrived here from Central and South America and are popular in the warmer coastal regions of the world. They like sun and don’t need a lot of water. Because they grow so quickly, they are considered invasive when they take over open areas, as in Australia. The flowers are poisonous to animals and can harm livestock. In gardens, they attract birds and butterflies. Since I don’t have cattle grazing on my balcony, and my cats show no interest, I will focus on the birds and the butterflies. And how the lantana flower heads remind me of all occasions requiring bouquets. Dances, graduations, weddings. Weddings across all ages and colors and genders. Celebrating the beauty of each individual and also the blending to create a whole. Saluting the welcoming, the bringing together, of divergent ideas to make us all stronger. The carnival of life for laughter and tears. Funerals, memorials, for those who sang and danced and are now gone but will not be forgotten. In addition to Carnival, lantanas bloom in other varieties. Confetti. Pink Frolic. Radiation. Sunburst. Spreading Sunshine. Spreading Sunset.